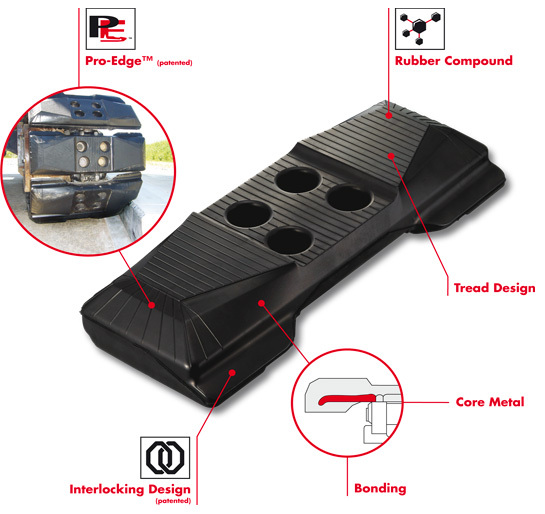 GeoGrips use Bridgestone’s latest “Pro-Edge™” embedded core metals. The special rounded profile wing design combined with the tapered rubber tread lug profile disperse stress concentrations which significantly reduces edge-cut damage caused by riding over curbs or sharp obstacles. The core metals are embedded in a thick super abrasion-resistant rubber compound which provides a highly robust and durable solution for tracked machines. GeoGrip’s tread profile is based on Bridgestone’s optimized design for high durability, anti-chunking, anti-cut and good turnability. GeoGrip embedded core metals are forged using special treated steel to provide greater strength and anti-abrasion performance. GeoGrip’s unique interlocking design reduces the build-up of sand, gravel, rocks and other material or objects in and around the undercarriage, thereby avoiding premature damage.